Hide Folders is a freeware app dedicated to hide files and folders on the Mac. 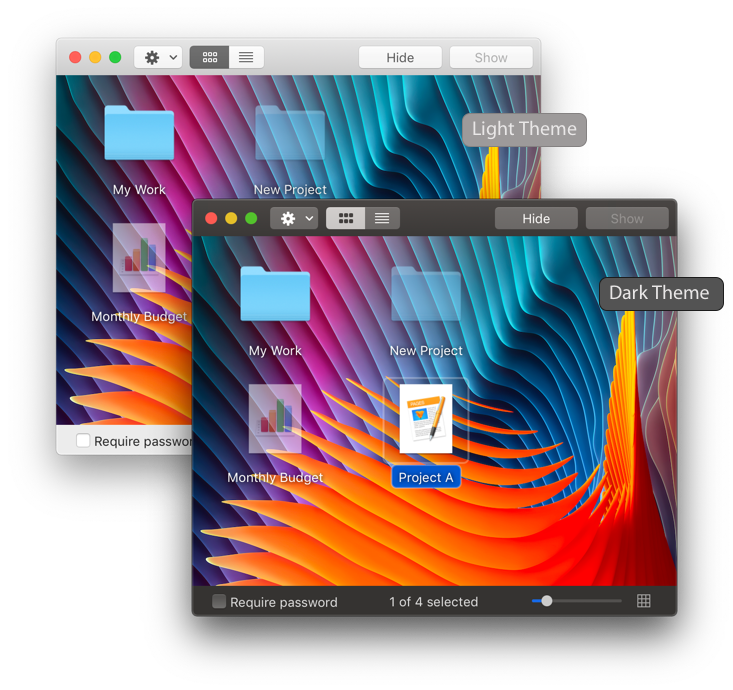 Hide Folders is a very popular Mac application that allows you to hide your personal files and folders. Hide Folders works with all modern Macs running macOS. Hide Folders for Mac is free to download and you can freely use it as long as you wish. There is also a Pro version which includes some additional features. The nice thing with this app is that you just need a simple click on the “Hide” button to hide a folder with all its files. Think if your child would delete your important work project by mistake… There are always folders or documents in your Mac that you prefer not to be seen, opened or edited by other people using your Mac. That’s why you have the possibility hiding files quickly can be vital. Hide Folders for Mac is freeware, this means that you can freely use it as long as you wish. With just a click, conceal files and folders and their contents. Hide Folders is created by Altomac™, this means that you can immediately focus on your task, not even noticing that you’re using an entirely new app. Get more info on how we create software for Mac here. Protect your files avoiding them to be being modified, seen or erased by other people who use your Mac. The app becomes even more useful when you are the only one that can only use it. It is for this reason that we implemented the Require Password feature, it lets you protect the app with a password. If this option is selected, to open the app it will be necessary to enter the correct password. This is a Hide Folders Pro feature. If you would like to buy the Pro edition, just go to our Online Store. Hide Folders is so easy to use because it works just as you are used to do things everyday with your Mac. The Require Password check button lets you protect the app with a password. If this option is selected, to open the app it will be necessary to enter the correct password. This is a Hide Folders Pro feature, to buy the Pro version, please follow this link: Buy Pro Version. 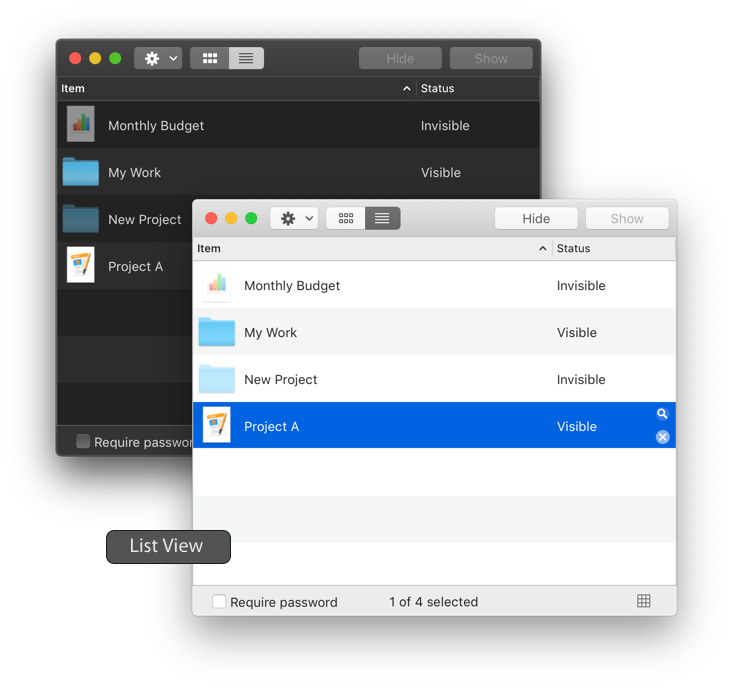 Hide Folders uses the standard functionality of the Mac Operating System to make files and folders invisible. The files and folders that are hidden, remain in the same place they were in when they were visible, and they move when you move the folders that contain them. You can learn more about how does it work at our support page. Whether you’re looking for answers, or would like to solve a problem, just contact us. We are happy to help. Hide Folders prevents occasional users of your Mac to view, open, or change files or documents while browsing the contents of your hard drive but please note that it don’t makes your data safe or secure. Programmers and experienced users could gain access to a folder or a file made invisible. Also please be warned that there are some applications that let you open files contained in a folder made invisible. To learn more about protecting data and information on Mac, visit this page about macOS Security by Apple. If you want to hide your documents and folders, Hide Folders for Mac is just what you are searching for. Hide Folders prevents occasional users of your Mac to view, open or change documents and folders while browsing the contents of your hard drive.